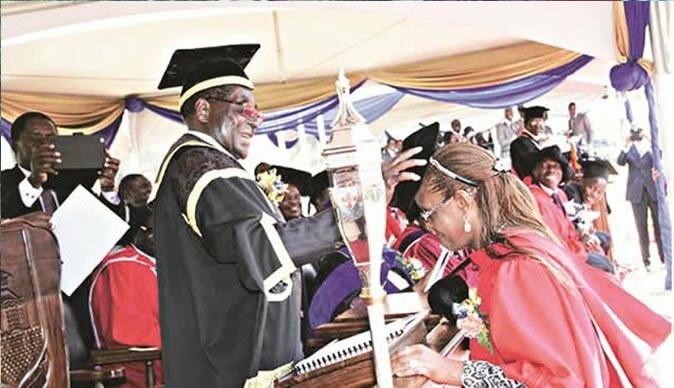 THE University of Zimbabwe’s vice chancellor, Levi Nyagura, has been suspended over the controversial award of a doctorate degree to former first lady Grace Mugabe. Nyagura is currently facing criminal charges in court over the 2014 degree award. A letter signed by President Emmerson Mnangagwa’s chief secretary, Misheck Sibanda, says Nyagura would be under suspension until the completion of his court case. “Please be advised that His Excellency, the President of the Republic of Zimbabwe and Chancellor of the University of Zimbabwe, being the appointing authority (in) terms of section 8 of the University of Zimbabwe Act, hereby suspends Professor Levi M. Nyagura as the Vice Chancellor of the University of Zimbabwe pending the finalisation of his alleged charges of criminal abuse of office,” Sibanda wrote to Higher Education Minister Amon Murwira on August 16. Nyagura’s trial has been set down to run from August 22 to 28. Prosecutors say Nyagura unilaterally accepted and approved Grace Mugabe’s application to study for a PhD in Sociology, without involving the department and the faculty’s higher degrees committee, according to laid down procedure. The vice chancellor is also accused of usurping the university senate’s powers when he appointed examiners. According to the state’s papers, Nyagura then led supervisors and examiners to Grace’s Mazowe estate where the oral defence examination was done without the knowledge or approval of the academic committee. Grace graduated with a PhD in September 2014, months after launching her short-lived political career. Here 226-page on “The Changing Social Structures and Functions of the Family – The Case of Children’s Homes in Zimbabwe”, has been roundly panned by academics. The sociology faculty at the University of Zimbabwe petitioned the Zimbabwe Anti-Corruption Commission to probe what they described as academic fraud in the award of the degree to Grace.